This past week, we had some unseasonable weather out here in the Bay Area. Clear skies, warm temps, people lunching in outdoor cafes – it felt like spring was here. Now this slice of glorious weather is to be short lived, as we have a storm coming our way this weekend, and it will be back to rainboots and jackets, for the next week. You can imagine, I was excited to break out of my tall boots and skinnies, for sandals and some sleeveless tops. While lunching with girlfriends earlier in the week, they asked if I’d taken a picture of my outfit that day, to share on AskSuzanneBell. Having played catch-up most of the morning, I hadn’t thought much about doing so – till later that day, I had my 10 year old snap a few shots (all in about 2 minutes), in the parking lot behind his orthodontist. We had some laughs while taking these, so I thought I would share my weekday spring look with you all. Finding a couple of new tops, to work back with denim, have been on my Spring Hot List (read more about crafting your own Hot List, in this ASB post HERE). I was excited when I found this tie dye sleeveless top from Haute Hippie (fave brand!) over at Poshmark for $20.00. 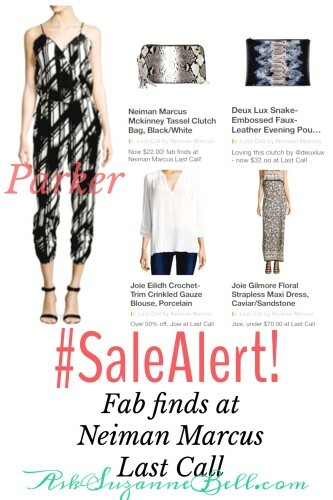 You can read more on buying and selling on Poshmark, in this ASB postHERE. Want to try Poshmark? Download the app, join with code JICFU and get a $10.00 credit on your account to shop! This silk top is light as a feather, so I opted to accessorize it with my Gorjana Tanner small pendant, long pendant necklace, similar HERE, and a simple bracelet. 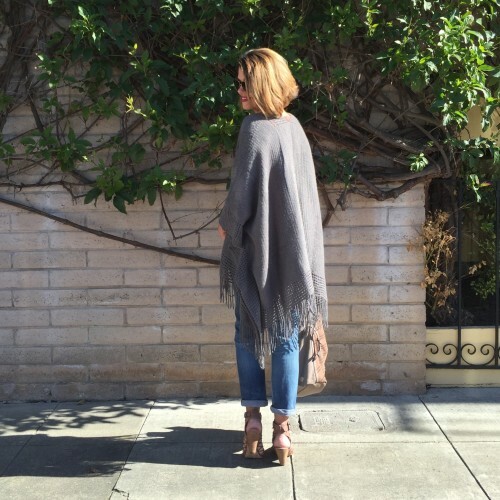 A fringe poncho, from Max Studio, added the perfect layer to my boho look. 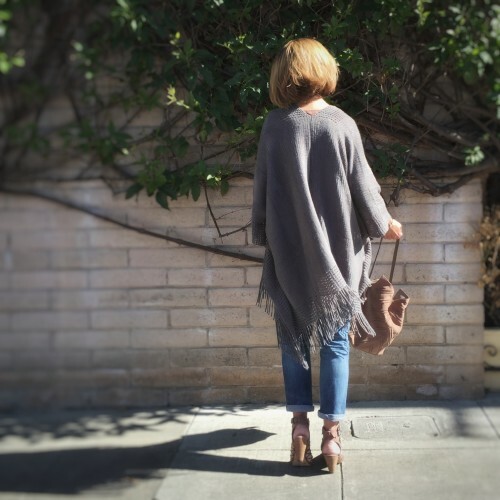 I love the way the fringe swishes around on this poncho! I have to say, the ‘Emerson’ jean from Citizens, is my favorite, most comfortable pair of denim in my closet. I personally like a few holes in my jeans, but the ‘Emerson’ is available sans holes as well. The ‘Emerson’ jean, has a more tapered/slimmer cut, than many of the boyfriend styles out there – which I prefer. If you prefer a more slouchy look, check out the ‘Ex-Boyfriend’ by AG. I’ve been getting quite a bit of wear out of these Vince Camuto ‘Evel’ sandals (on sale at Nordstrom for $79.90). The heel is a good height for me. The elastic on the sides may be uncomfortable for some. It has not bothered me, but it does leave marks on my feet at the end of the day. If the elastic bothers you, this shoe may be a good option. Sometimes you just know. 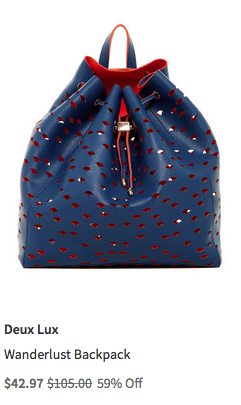 And, when I spotted the Vince Camuto ‘Nella’ hobo bag, I knew she was going to be my new spring/summer bag. I love the taupe/grey color. It works great back to white, black, denim, and greys. The fringe tassel and boho stitching on the front is an added bonus! Look to this new color, as an option to your cognac bag of past seasons. Its a beautiful color update, and I am starting to see it pop up, at every price point! What I love about all of these pieces, is they work fabulously together. I have switched out the bottom, for a dark flare jean and wedges, for a casual night out look. Pop on a white tee and flip flops, and I’m ready for a day at the beach. Do you have a favorite go-to look? Does your weekday look differ from your weekend look? Have you found a favorite boyfriend jean? Do you go for comfort or fashion, or a little of both? Drop your comments down below! Ready to cleanup your closet? Pop over to the ASB Closet Edit: The Purge, and start making some room! Not sure what to do with those items that are too nice to toss or donate? Read more on ThredUp, Poshmark, and consignment selling. Looking to live with less? Achieve a workable wardrobe? Do you just have too much stuff? 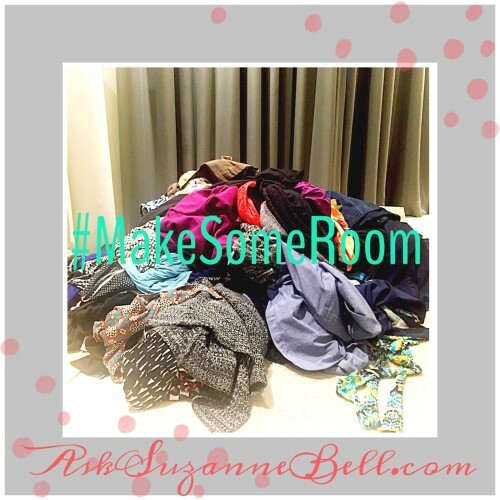 Overwhelmed by what’s in your closet? Do you have a lot of pieces, but lack outfits for everyday? Try the 30/30 Remix Challenge, to gain insight into your personal style and shopping habits. 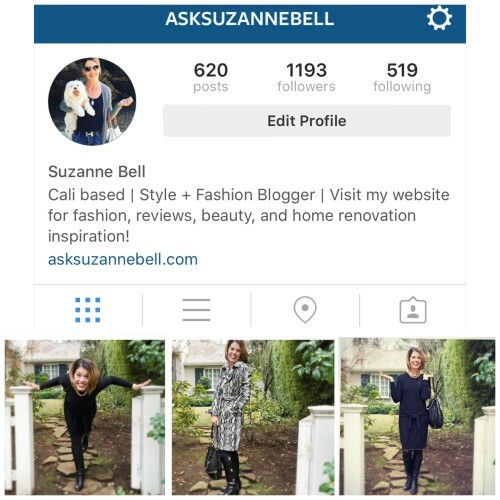 for day-in-the life AskSuzanneBell moments and style. Wondering what’s on sale this weekend? Check out the AskSuzanneBell side bar on my homepage for the latest sales and happenings. 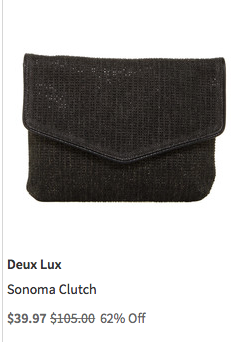 DeuxLux is a great brand for well priced, fashion bags. 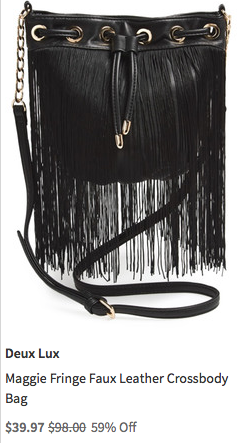 You’ve seen me wear this fringe crossbody/clutch, many a time on the blog. 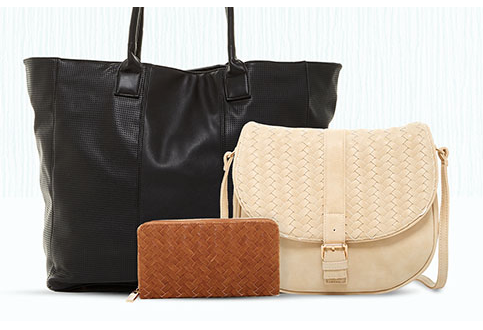 There are some great styles, at amazing prices over at HauteLook this weekend. Great anywhere clutch for spring, available in a natural/straw color as well. More colors available in both of these bags. Also currently on HauteLook: Roxy, Maxi Dressing, Joules Rainboots, 7 Jeans and more. 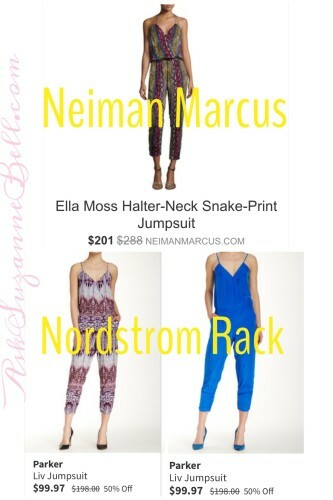 I find that I am looking to jumpsuits to replace a few of my maxi dresses for SS16. Here’s a few I’ve had my eye on, now on sale. Be sure to pop back on Wednesday, for the AskSuzanneBell Spring Shoe Preview – from Nordstrom to Target, shoe floor reviews and picks – let’s check out what’s new for Spring! I love these boyfriend jeans on you lady!! 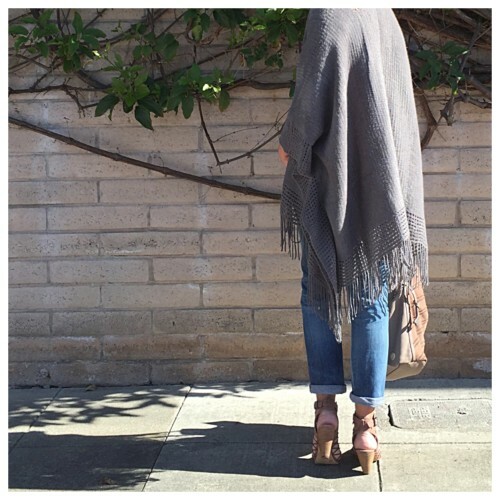 So cute, flirty, fun and fringe-tastic with that darling poncho and Vince bag. Thank you for linking up with My Refined Style! Just love your gorgeous look. Thank you for hosting the fun style link up! I am new to your link up – I love it! I had a lot of fun this weekend, surfing around your site and the sites of the other fabulous ladies who are hosting with you. I love finding new bloggers (especially 40+ ones) to follow and yours is now added to my list! Thanks for stopping my little space here on the web! Now this is my idea of transitioning into spring! You’ve got the cozy layers with the sandals at the ready! Plus the muted shades–I’m all about this right now. I apologize for taking so long to come visit Suzanne, but I really appreciate you coming over to link up. I hope I see you again this week! Hi Ann! Thank you so much for including me in your round up! Such an honor to be featured with all of the lovely ladies who linked up last week! I too, am loving all the muted neutrals – the color of this bag is my new favorite shade as it goes with pretty much everything. 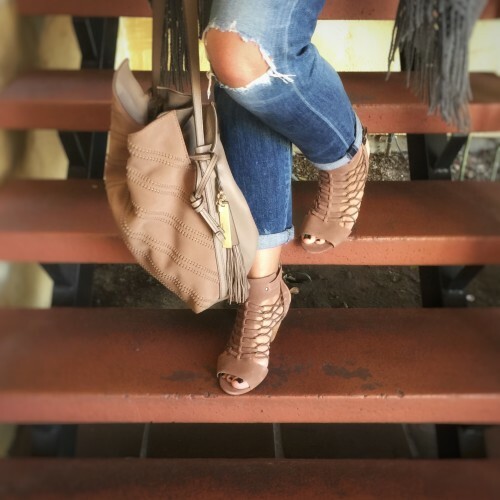 I linked back up this week and shared your fun post (love those bags) on my social channels. Hi Shel! The Color you see here, in this post, is “MINK”, Its a great bag, I love mine!